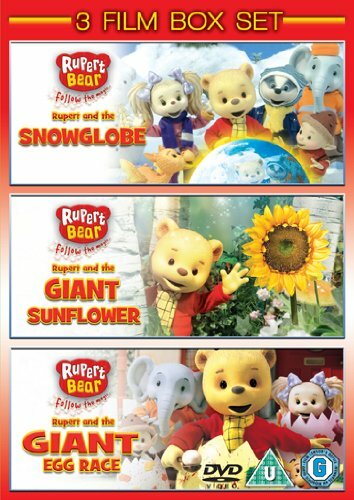 Firstly, the video clip above features the opening titles from the series, and I don't know about you, but I haven't heard that song since I was a kid! It was sung by the Irish singer Jackie Lee and was actually released on the Pye record label, reaching #14 in the UK charts in 1971. This wasn't the first time that Jackie had entered the charts, though. In 1968 she had a hit with the theme tune to the British version of the 1965 TV series The White Horse, which reached #10. 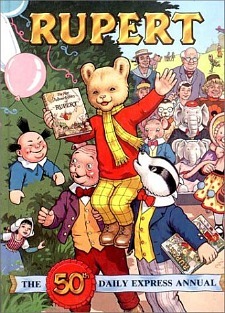 The Adventures of Rupert Bear was originally aired between 1970 and 1977 and 156 episodes were created. 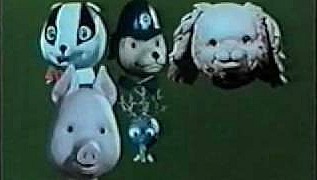 However, around half of them have gone missing, apparently, Well, judging by how creepy many kids found some of the puppets in this show, maybe that's not a bad thing! 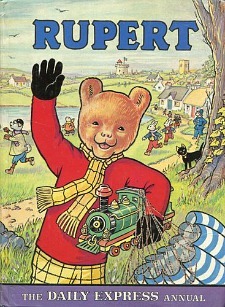 So who had a Rupert annual as a kid? I remember owning at least one during the 1970s, although when I was fed up with it I decided to use it for making paper aeroplanes - what was I thinking of? Old annuals can now fetch quite a hefty price, although, I doubt I would've ever kept it a good enough condition, even if I hadn't torn out its pages! Comparing the two annuals above, the artwork by Alfred Bestall on the cover of the 60s book is definitely superior to the 1976 edition by Alex Cubie. 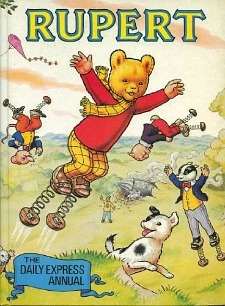 Bestall provided the artwork (and helped write the stories) between 1935 and 1974, with Cubie working as an artist for just three years between 1975 and 1977. John Harrold took over the role in 1978 until 2007, with Stuart Trotter providing the artwork from 2008 onwards, and he is also a writer. I was pretty excited to find a photo of the 1972 annual! This is the one I had, and now I just wish I'd have kept it. 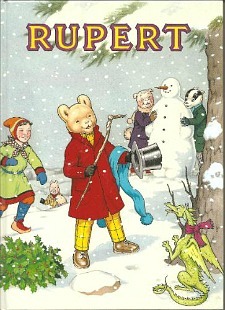 That cover (by Alfred Bestall) brings the memories flooding back, as well as a tear to my eye. This particular annual cost 50p, apparently! 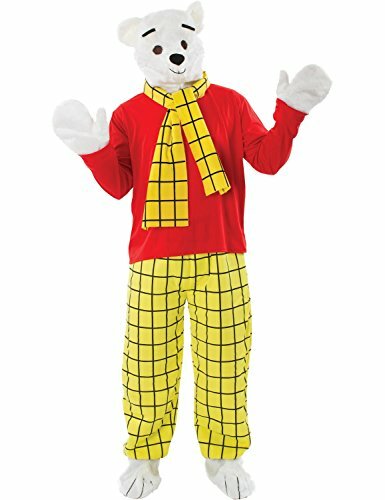 Rupert Bear made his first appearance as a comic strip in the Daily Express during 1920. 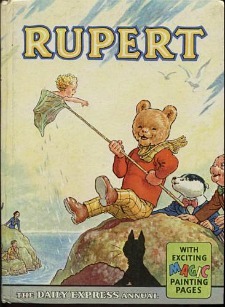 The annuals have been released every year since 1936. 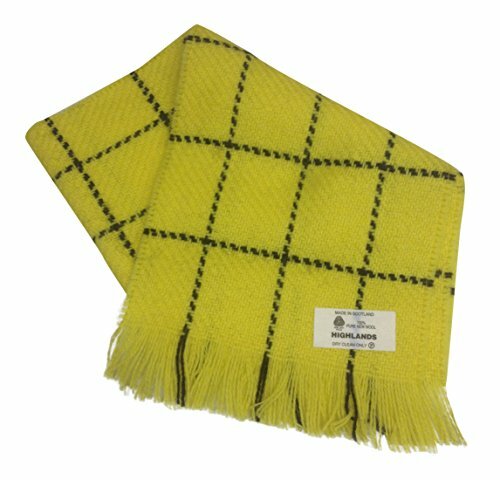 I always wanted a yellow, check scarf just like Rupert's as a kid, although I never fancied the matching trousers quite as much! 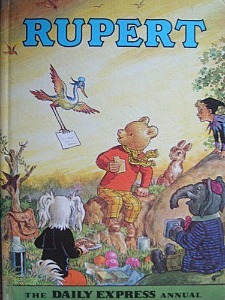 On this cover, Rupert is playing leapfrog with his friends Bill Badger, Algy Pug and Edward Trunk.